(Natural News) A recently released herbal medicine could offer a means of treating arthritis without resorting to non-steroidal anti-inflammatory drugs (NSAIDs). In a Korean animal study, the herbal complex ChondroT was shown to alleviate the crippling effects of osteoarthritis on rats. As more and more people enter old age, osteoarthritis is becoming a serious problem. The disease causes the breakdown of cartilage, which causes damage to the covered bone. Symptoms include severe pain and stiffness in joints as well as redness. In Korea, osteoarthritis is traditionally treated using Ganghwaljetongyeum. A herbal medicine made from 18 different plants, it relieves pain, improves joint motions, and reduces the swelling and inflammation caused by the disease. Dongshin University (DU) researchers reported that Ganghwaljetongyeum could prevent the production of inflammation-causing substances, thereby reducing the effects of rheumatoid arthritis. They identified the five most effective ingredients of the herbal complex, combined those medicinal plants, and created a new herbal agent called ChondroT. In tests conducted by the research team, ChondroT was shown to protect cartilage from arthritis and inflammation. Compared to Ganghwaljetongyeum, the new complex displayed greater effectiveness. Given these positive results from their earlier experiments, the DU researchers decided to investigate the therapeutic effects of ChondroT on osteoarthritis. They induced the disease in rats using collagenase injections before administering different treatment agents. One group of rats was set aside to serve as the control. The other groups received various treatments: One of three different doses – 50, 100, or 200 milligrams per kilogram (mg/kg) – of ChondroT, two mg/kg of indomethacin, or 20 mg/kg of Joins Tab. Indomethacin is an anti-inflammatory NSAID that is used to treat osteoarthritis and a form of spinal arthritis called ankylosing spondylitis. NSAIDs do not work for all patients and can cause gastrointestinal problems such as indigestion, vomiting, and ulcer edema. They may also affect the cardiovascular system. Meanwhile, Joins Tab is a new herbal medicine made from Korean virgin’s bower, Chinese snake gourd (Trichosanthes kirilowii), and the flowering plant Thesium. It is used to treat degenerative arthritis and rheumatoid arthritis. Joins Tan possesses anti-inflammatory and analgesic effects. It also prevents the destruction of cartilage and stops joint catabolic enzymes from activating. During treatment, the rats were observed for symptoms of osteoarthritis. Blood and tissue samples were taken for analysis. The DU researchers reported that the 100 and 200 mg/kg doses of ChondroT greatly decreased the levels of TNF-? and IL-1?. These two cytokines destroy cartilage, damage cartilage bone, and cause inflammation. Furthermore, all three doses of ChondroT decreased the amounts of IL-6 in the blood and joint fluid. IL-6 reportedly plays a big part in osteoarthritis and encourages processes that damage the cartilage joint. 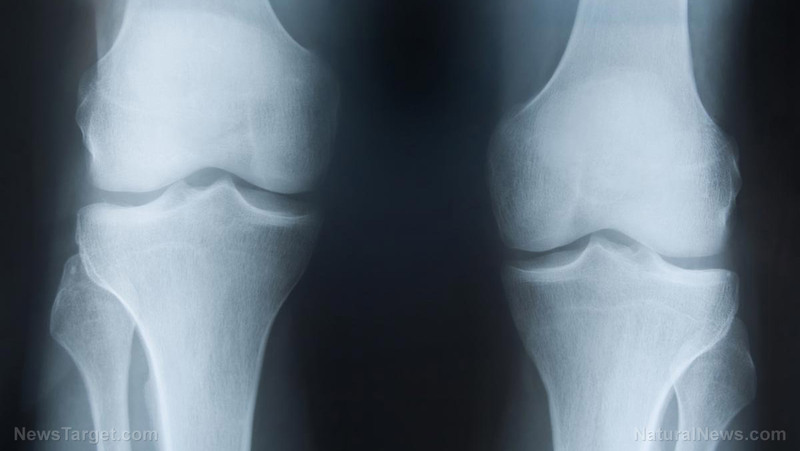 Knee tissues from mice treated with the 100 and 200 mg/kg doses of ChondroT showed that the synovial cells, lacunae, and cartilage cells were intact. In addition, the 200 mg/kg group also showed higher levels of proteoglycans in the cartilage near the bone tissue. During the experiment, the researchers observed that the 200 mg/kg dose of ChondroT consistently showed positive effects on tissue affected by arthritis. They concluded that this dosage of herbal medication could stop inflammation-causing cytokines, lessens the immune response, prevents damage to cartilage tissue, and protects the articular surface from inflammation attributed to osteoarthritis. Learn about other ways of treating arthritis at AlternativeMedicine.news.